What’s in it: The book presents an informed, practical case for ethical consumerism. After an introduction which encourages you not to panic and inspires you to take concrete action, Clawson organizes her book into seven chapters, each of which discusses an area of spending: coffee, chocolate, cars, food, clothes, waste, and debt. I’m going to be honest: I mainly read the sections on coffee, chocolate, and clothes, because that’s where I am in my journey (and I’m just starting to think about clothes). Why I recommend it: If you are even marginally interested in ethical spending, this book provides a great, non-overwhelming introduction to the issues. The book’s format lets you skip to whatever area interests you, and the chapters are fairly short (around 20 pages each). In those pages, Clawson delivers lots of information through a casual, readable style. I particularly love the depth at which she looks at Scripture. My favorite part, however, is that each chapter ends with resources for further study. It is through this book that I found the three others I am currently reading. Any drawbacks? This book functions well as an introduction to the issues, but I (and most certainly the author herself) would recommend further study. After all, twenty pages per chapter is not much when you include, as Clawson does, personal stories, little anecdotes, global history, Scripture analysis, and action steps. Still, this book is a great place to start informing yourself about slavery issues and ethical consumerism. “All too often I find that conversations that involve changing our lifestyles result in us feeling overwhelmed at the sheer immensity of the problem. There is too much hurt out there, too much that needs to change, and too much to tackle all at once. From just becoming aware of the needs in the world, to realizing that our lifestyle choices make a difference, to understanding how our faith informs how we approach justice issues, we can feel shaken to the core. Encountering new ideas and allowing those ideas to change who we are is a huge step for most of us. Too often we live compartmentalized lives that don’t allow for the different spheres of our existence to interact. Church is separate from shopping. Our morning latte doesn’t connect with our volunteer work…Our waste disposal habits are removed from our politics. They each exist separately and apart in our hectic lives. I found my copy of this book at my local library. It’s currently available at half.com for less than $5. In fact, if you are interested in reading it, but can’t afford it, send me your address, and I will order one for you! 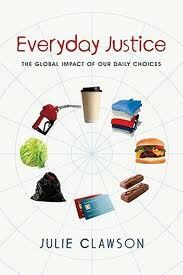 “Our local, everyday choices reverberate around the world.” Great quote to pull from the book, Kim. Being mindful of how our actions and choices affect others is part of recognizing and loving our neighbor, isn’t it? Just found your post. I’d like to get this book. Thanks for having a post on it. I’ve always been a very frugal person with day-to-day life, and I’ve found that some of my practices (that were purely for frugality) are actually very green and/or ethical. But I’d like to go deeper in more ethical living and this book sounds like a good introduction.